The Big Wobble: Nuuk warmer than New York as Greenland records it's warmest temperature in June ever! The monthly average ice extent for May 2016 is more than 386,000 square miles below that observed in May 2012." A temperature of 75 degrees Fahrenheit (24 degrees Celsius) was recorded on June 9, 2016 in the capital of Greenland, Nuuk. This is the maximum ever temperature reached by Greenland during the month of June. Nuuk is located on the southwestern periphery of the Arctic country and usually witnesses the warmest temperatures as compared to other regions of the country. The temperature of the capital exceeded that of New York City, which experienced a temperature of 71 degrees Fahrenheit. It has been established by the Danish Meteorological Institute (DMI) that the Thursday temperature of Nuuk will assume the position of highest temperature record, which was earlier held by Kangerlussuaq, where the temperature soared to 73.8 degrees Fahrenheit (23.2 degrees Celsius) on June 15, 2014. Kangerlussuaq is also located on the southwest flank of Greenland at a distance of approximately 200 miles (320 km) from Nuuk towards north. The reason behind the high temperature in Nuuk has been explained by a Senior Climatologist at the DMI, John Cappelen, as the result of winds coming from the eastern direction. These winds are formed between high pressure over northeast Greenland and low pressure south of Greenland. 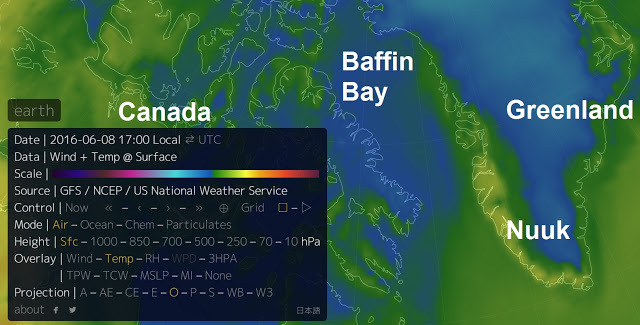 Winds blow downhill, when they reach Nuuk from east, resulting in rise in temperature. This occurs due to a phenomenon known as adiabatic warming, during which air gets compressed from low to high pressure. The Thursday's highest temperature measurement was the second unusually high temperature day in southwest Greenlands starting from April, which marked the premature onset of ice melting season a month before the usual commencement. Kangerlussuaq experienced a temperature of 64.4 degrees Fahrenheit (17.8 degrees Celsius) on April 11, 2016. "This was the warmest April temperature on record at that location, and it nearly set an all-time warm temperature record for Greenland as a whole," said Mashable's Andrew Freedman. A report published in Washington Post" revealed, "Nuuk, Greenland's capital, soared to 75 degrees (24 Celsius) Thursday, marking the warmest temperature ever recorded in the Arctic country during June. Nuuk sits on Greenland's southwest coast, where the country's warmest weather typically occurs." "This is the sixth earliest onset of ice loss in our 27-year record, although there isn't really a large difference from one year to the next in the top-ranking 17 years," said climate scientist Peter Langen. Greenland's exceptional warmth in 2016 piles on to other record-warm milestones established in recent years. In 2012, the temperature in Narsarsuaq, on the southern coast, soared to 76.6 degrees in May - a new monthly record, according to Jeff Masters at Weather Underground. It was also the warmest winter on record across the Arctic, says the National Snow and Ice Data Center, which reported that large areas recorded their "warmest conditions in 67 years of weather model data, including the northern half of the Greenland ice sheet." "Satellite observations published by the U.S. National Snow and Ice Data Center on Tuesday reveal that Arctic sea ice covered an area of just 4.63 million square miles (12 million square kilometers). That's about 5 percent lower than the previous record low, set in May 2004, and more than 10 percent lower than the average sea ice extent from 1981 to 2010," according to a news report published by National Geographic. The study, authored by a team led by Marco Tedesco of Columbia University's Earth Institute, analyzed weather data to show that Greenland's record melting in the summer of 2015 was caused by unusual wobbles in the jet stream, the undulating, riverlike current of air that circles the Northern Hemisphere. It's thought that by lessening the temperature difference between polar latitudes and more temperate regions, climate change can slow down the jet stream, and this slowdown could give the jet stream enough wiggle room to let it bend far more northward than it usually does. In fact, the study reveals the northernmost record of the jet stream ever observed. "The average area of sea ice atop the Arctic Ocean last month was just 4.63 million square miles, according to the National Snow and Ice Data Center. That beats the prior May record (from 2004) by more than 200,000 square miles, and is well over 500,000 square miles below the average for the month." "Daily extents in May were also two to four weeks ahead of levels seen in 2012, which had the lowest September extent in the satellite record. The monthly average extent for May 2016 is more than 386,000 square miles below that observed in May 2012." "We've never seen anything like this before," said Mark Serreze, who directs the center. "It's way below the previous record, very far below it, and we're something like almost a month ahead of where we were in 2012."